In case you don’t know, I’m a total dork. A nerd. A nature nut. I loved watching NOVA as a kid with my parents, and I think spiders are extremely interesting. Nerd. But today! You will agree with me that this is SUPER cool, and we will be nerds together. This week I was joking with my neighbor, and I asked if he might need the head of a rabbit that the dog brought home. He politely declined, but this started the conversation of the “Wild Kingdom-like” nature that was occurring in his front yard. Another neighbor found a baby great horned owl in front of his yard near the road, so they took it to Walden’s Puddle wildlife rehab center in Joelton, TN. Walden’s Puddle then came out later that day and found the nest that the baby had fallen from. It was in my neighbor’s front yard! Walden’s Puddle came back today to replace the baby owl back into the nest with it’s sibling. Apparently, great horned owls stay with their parents for up to two years, so the re-nest is very important. WOW! And I have photos!! AH! They brought an arborist to climb up into the tree. First he attached a laundry basket to the tree as the newer, bigger nest. The original was too small for these guys. 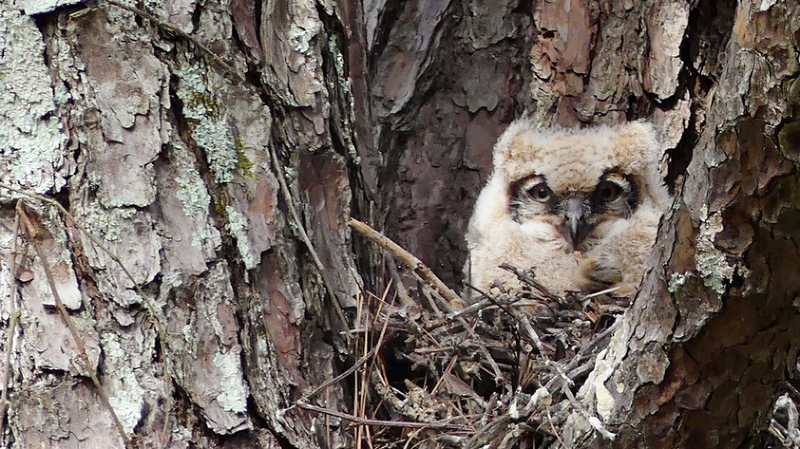 Great horned owls are huge birds even at two weeks old. 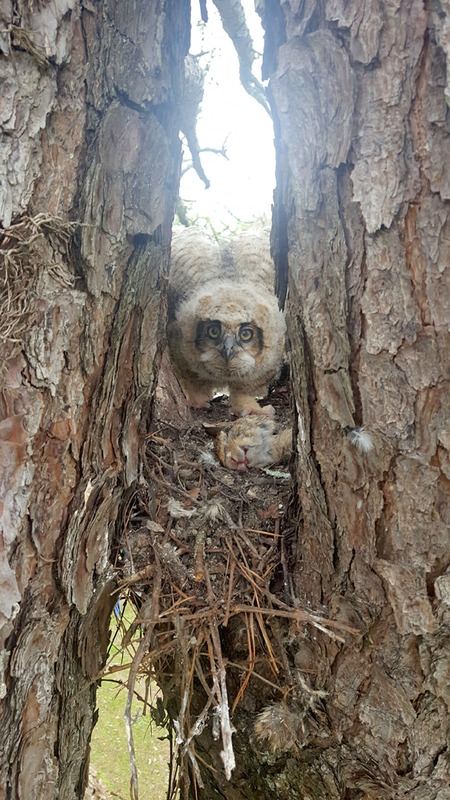 After the new nest was secured, the fallen baby owl was lifted up in a pillow case to the arborist, and he placed them both into the new substitute nest. This was a very happy nerd moment for me, and I just had to share it with you. Also check out the photo my neighbor captured (he’s a fellow nature photography nut) with the baby owl and it’s meal. Can you see what it is? It’s a rabbit head. I wonder if the one my dog brought home was meant for the baby owl. The moral of this story? Be neighborly, do unto others, love one another, and all that neighborly stuff the bible talks about because it’s a true blessing to have great neighbors. Maybe you don’t have to be weird like me and offer up rabbit heads, but any kindness to others is what we are called to do. Owl you need is love. Love is owl you need. Walden’s Puddle getting fallen baby owl out from cage. 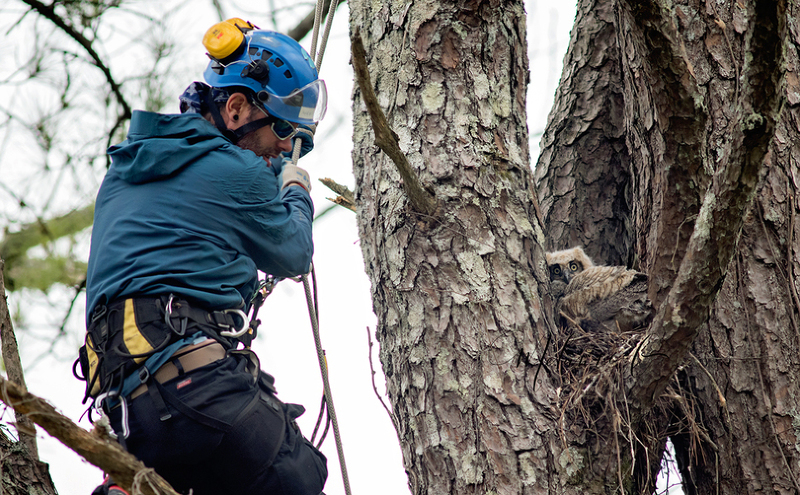 Arborist getting baby owl into new nest. This chubby 6 month old cupid cutie is getting his hearts and kisses ready to send for Valentines Day! I hope yours is full of love! This angel was born just days before Christmas, and I was privileged to photograph him on New Year’s Eve. What a perfect gift for these first time parents! Dad plays baseball, so we were sure to use his glove in their first born son’s photos. The pets would not be left out of the family photos either! They jumped in as soon as we all went into the nursery. Love fills and flows through their home. Happy St.Patrick’s Day to you! The luck of the Irish be with you!